This is for NEW members only, please do not order if you are already a Young Living Member. Home Diffuser & 11 amazing Therapeutic Grade A Essential Oils. Here is a quick overview. + Lavender 5-ml = Relaxation, Great for Sleep, Skin & for spraying linens for amazing scent & refreshing. Diffuse for a calming and comforting scent. Unwind by adding a few drops to Epsom salts for a relaxing nigh-time bath. Add to carrier oil (coconut, almond, grapeseed oil) & apply to skin to soothe & promote relaxation. Add to your favorite shampoo, lotion, or skin care products. + Peppermint Vitality 5-ml = Stimulating & Energizing when focus & concentration are required. Use on the back of neck for a cooling effect after exercise, yard work, or strenuous activity. Add to herbal tea to help soothe an occasional upset stomach. Use in a Capsule with carrier oil to maintain the efficiency of the digestive tract. Use 4 drops in a pan of brownies for a Secret ingredient <3. + Lemon Vitality 5-ml = Invigorating, Great for cleaning add to a natural household cleaner, removes gummy residue, diffuse for a clean, fresh scent. Apply to tough laundry stains directly or add to detergent to brighten whites. Includes the naturally occurring constituent Limonene. + Copaiba Vitality 5-ml = Is an excellent addition to natural skincare regimens. Can be emotionally calming, securing, & grounding when diffused or applied topically. Add to epsom salts & soak in a bath to relax after strenuous workouts. Take daily as a dietary supplement in a teaspoon of honey as part of a daily health regimen. Includes the naturally occuring constituents beta-caryophyllene and Alpha-humulene. + Frankincense 5-ml = Dilute with carrier oil & Apply directly to skin. Diffuse or inhale to increase spirituality and inner strength, lift mood, and inspire balanced emotions. May help smooth the appearance of healthy looking skin. + Thieves® Vitality 5-ml = Is an excellent cleaner & degreaser. Dilute according to label instructions and apply to the soles of feet daily. Diffuse to create an environment of peace & security. May contribute to wellness when taken as a dietary supplement. + Purification® 5-ml = add 2 drops to a wet cloth & put in clothes dryer to refresh stale, wet laundry. Add to cotton ball & place in trash receptacles, diaper pails, or stinky shoes. Diffuse with lemon to create a fresh scent. Add to YL's bath & shower gel base or Epsom salts for a soothing bath. Make for a great foot massage oil when diluted! 5-ml = Dilute with carrier oil & apply to chest, neck & throat. Apply to a warm wet towel to use as a hot compress or massage into chest & throat 2-3 times a day. Rub on Feet or chest before exercise. Diffuse at bedtime for a comforting aroma. + DiGize Vitality 5-ml = Diffuse after dinner or dilute & apply to wrists & abdomen after a heavy meal. Massage directly on the abdomen in circular motion. Diffuse in the car to help kids feel calm during long rides. When traveling abroad add a drop to your drinking water. + PanAway® 5-ml = Apply Topically or use in epsom salt bath for a relaxing spa-like atmosphere. Combine with carrier oil & apply to temples, neck, back or shoulders for a stimulating aromatic experience. Add to whipped coconut oil for a pleasing balm that can be used after stretching or exercising. Keep it in your gym bag for use after workouts. + Stress Away 5-ml = Young Living's Special blend is a natural solution created to combat normal stresses that creep into everyday life. It can help induce relaxation and reduce occasional nervous tension. Wonderful for students & performers! 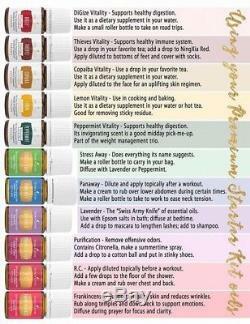 BONUSES : AromaGlide Roller Fitment, 10 Sample Packets, 10 Love It? Sample Business Cards, 10 Love It? Sample Oil Bottles, 2 NingXia Red® 2-oz. Samples, Product Guide and Product Price List, Essential Oil Magazine Essential Edge, & Member Resources. I will give you a temporary password when I sign you up, then you will be able to log in and change it. Enjoy 24 percent off retail pricing on your favorite products. Participate in the compensation plan and earn commissions just by sharing Young Living. Qualify for exclusive Young Living member events around the world. Enjoy the benefits and convenience of Essential Rewards. Enjoy ongoing learning & education at YL University. The item "Young Living Premium Starter Kit 11 Essential Oils Diffuser Samples Membership" is in sale since Sunday, February 18, 2018. This item is in the category "Health & Beauty\Natural & Alternative Remedies\Aromatherapy". The seller is "rjcny00" and is located in Jacksonville, Florida. This item can be shipped to United States.